My latest iOS app, Smart Lockscreen Creator has just released on iPhone for $.99. Currently your lockscreen on your iOS device is nothing more than a pretty watch with a background. Jailbreakers have solved this issue with an incredible application called intelliscreen, which adds lots of interesting information to it. However, you and I are Apple fanboys and won’t violate our precious iPhones with jailbreaking. Enter Smart Lockscreen Creator. Smart Lockscreen Creator allows you to build a completely custom (and smart) lockscreen image within the application. You then set this image as your lockscreen background. The following items are currently supported by the app. Here are some promo codes. If you fail to grab one and have some interest in reviewing the app on your site, I would be happy to email you one. 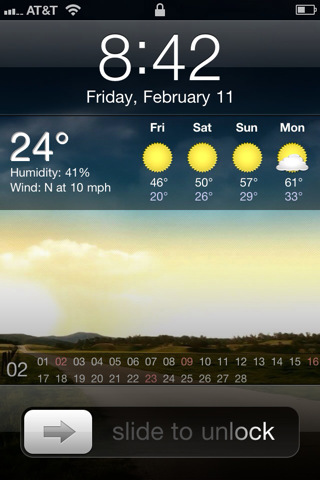 If you have any suggestion for lockscreen “widgets”, don’t hesitate to post them here.